Rebecca Allan. 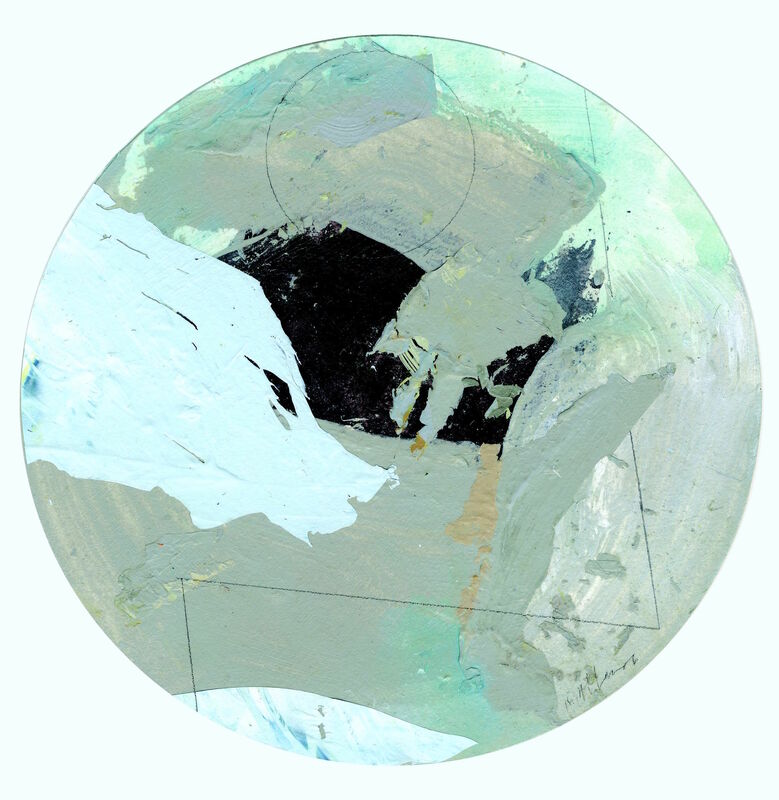 “Mint Green Fjord Tondino.” Acrylic & Peel Collage on Paper (2015). “Divided Canyon Tondino.” Acrylic & Peel Collage on Paper (2015). “Strawberry Ice Cream Glacier Tondino.” Acrylic & Peel Collage on Paper (2012). ES: We’ve selected a number of your tondinos, or globe-shaped works to feature in this issue, which you have made alongside your other landscape-oriented work for quite some time. Would you talk a bit about what led you to this shape, what you call “tondos,” after the Renaissance term for a circular work of art? RA: Working with the tondos (circular paintings) occurred to me after seeing the oculus in the dome of the Pantheon in Rome. I thought about how dynamic the landscape and sky might look if they were viewed through this frame. At the same time I was becoming impatient with what you might call the modernist treatment of the pictorial space as continuous with the surrounding world. Degas’ technique of continuing a dancer’s extended arm beyond the edge of the frame became a revolutionary mode of composing space vis-à-vis the edges of the rectangle. He took advantage of the aesthetic possibilities of photography. We seem to take that relationship to the rectangle for granted now. I adore Degas’ awkwardly posed bathers, but I also wanted to investigate new ways of composing that were not dependent on the vertical and horizontal axis. This approach to making the work metaphorically underscores the feeling that I have when I am in the landscape, especially in the mountains or near rivers. “Tondino” is the term I invented to describe the small tondos that are made on paper and are usually 9 inches in diameter. 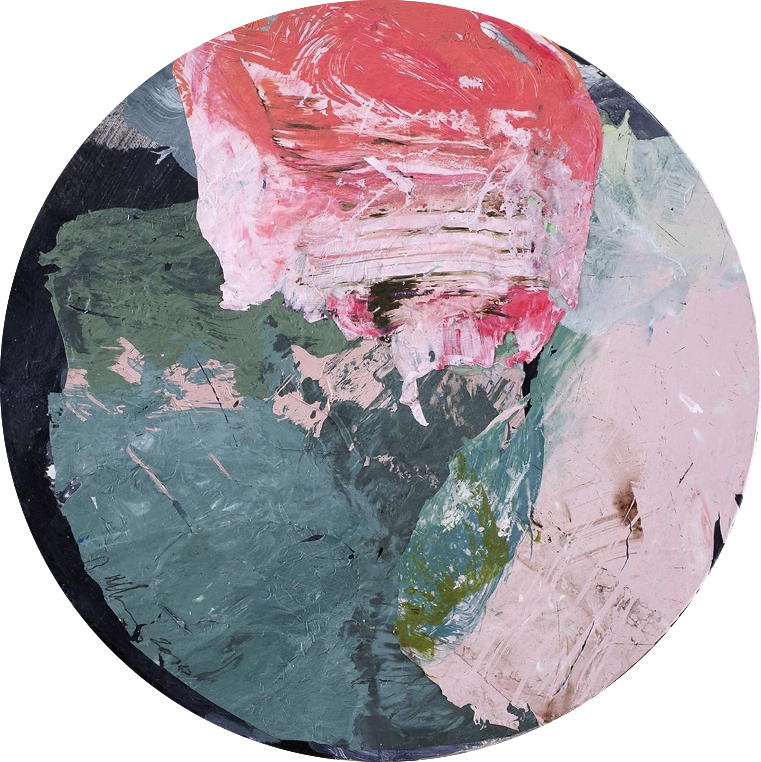 ES: I’m so intrigued by your process, the work consisting of drawing, painting, and collaging with peeled paint. In your studio you demonstrated the lifting of small skins of acrylic from a surface you prepare and later apply to canvas. An awareness of this last part of the process can’t help but inform one’s experience of the work: looking for and discovering a depth or detachment in the surfaces, an experience that might otherwise be subliminal. How did you come by this method, and, if you can say, how does this alter what you are able to achieve in your work? RA: You’re talking about a technique I developed that I refer to as “peel collage.” I brush down very thin layers of paint onto my glass palette, and then, when the paint is dry, I remove the skins with a razor blade (and a lot of finesse!) from the glass and apply them to canvas or paper. In my early days, I was immersed in the work of Hannah Hoch, Anne Ryan, Kurt Schwitters, and others pioneers of collage and photomontage. In the 1980s, my teacher Richard Kleeman (at Allegheny College) was working with shards of old wallpaper from his studio building and also working with thin skins of raw leather. I now understand that my own interest in the transformation of materials was catalyzed way back then, when I saw how radically you could describe a new form or make a new world by re-combining or re-working the found materials. Incorporating the peels allows me to introduce a new texture and also to suggest an entirely new image, that results from a (more or less) accidental process. When I peel the paint up from my palette, I cannot predict what patterns the paint will have made when it dried. Also, I love the peels because they are sometimes as thin as seaweed, and can often be challenging to manipulate. In fact, before I started using the peels consciously, I was just scraping down my palette every day and schmearing the leftover paint onto a new surface, or even worse, tossing all that good paint into the trash. What was I thinking? ES: How do these tondinos relate to the larger round canvases? RA: The tondinos are smaller (usually around 9 inches in diameter), but they’re no less confounding to work on. The tondinos allow me to work relatively quickly, and also to try to coax out new imagery that might suggest water in its various states, geologic patterns in the earth, and the weather situations. It’s never really an either/or situation in painting because you have to be open to situations emerging that you were not planning, and then to work with those. It’s a bit like when words clack against each other in poems. The sound of the words in your head creates yet another form, no? With the tondinos, because of their small size, I can quickly tear them up if they are awful, or, if I notice the seed of an idea, I can develop it on a larger tondo. ES: Rebecca, having followed your work for several years now I know you deeply engaged with landscapes and watersheds what you call landscape ecology. Would you say a few words about The Crossroads Project, a collaboration you are part of, made up of musicians and scientists working and performing to draw attention to issues of sustainability? And how does your collaboration then inform your ongoing work apart from this. RA: I’m happy you want to know about that because for me, collaborating with musicians, and now a physicist has opened my work to new frames of reference and challenged me to learn a few new languages! In 2012, I became a principle collaborator of The Crossroads Project—together with environmental scientist Dr. Robert Davies and the Fry Street Quartet (both at Utah State University), New York-based composer Laura Kaminsky, and Canadian environmental photographer Garth Lenz. We developed Rising Tide, a multi-disciplinary performance piece that addresses climate change through the perspectives of environmental science, chamber music, and visual art. My paintings serve as a visual environment that evokes and anticipates spoken-word passages as well as music. We were the keynote presenters at the 2012 national conference of the Association for the Advancement of Sustainability in Higher Education in Los Angeles, and have performed at venues including: the University of Monterrey (Mexico), University of Iowa, Doane College in Nebraska, Utah State University, University of North Carolina, Asheville, and Symphony Space in New York City. This work is incredibly moving to me and it puts me in touch with people of all ages and backgrounds around the United States who are engaging with the very difficult challenges of living with and responding to the impact of profound environmental shifts on this planet. 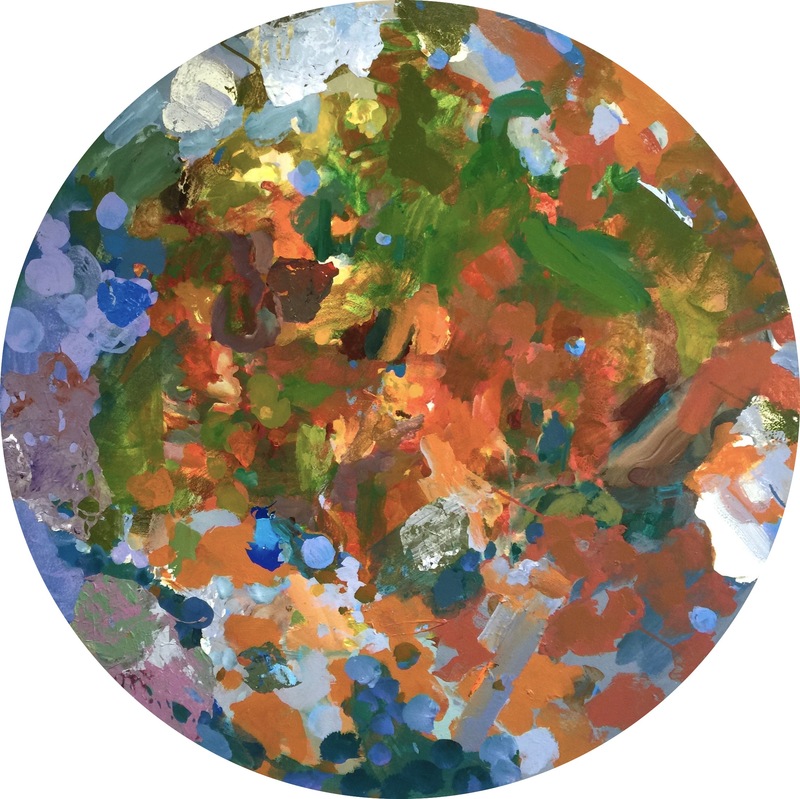 When I work on the tondos they are, in a metaphorical way, abstract images of the planet. “Hiding Mountain / February Tondino.” Acrylic & Peel Collage on Paper (2009). 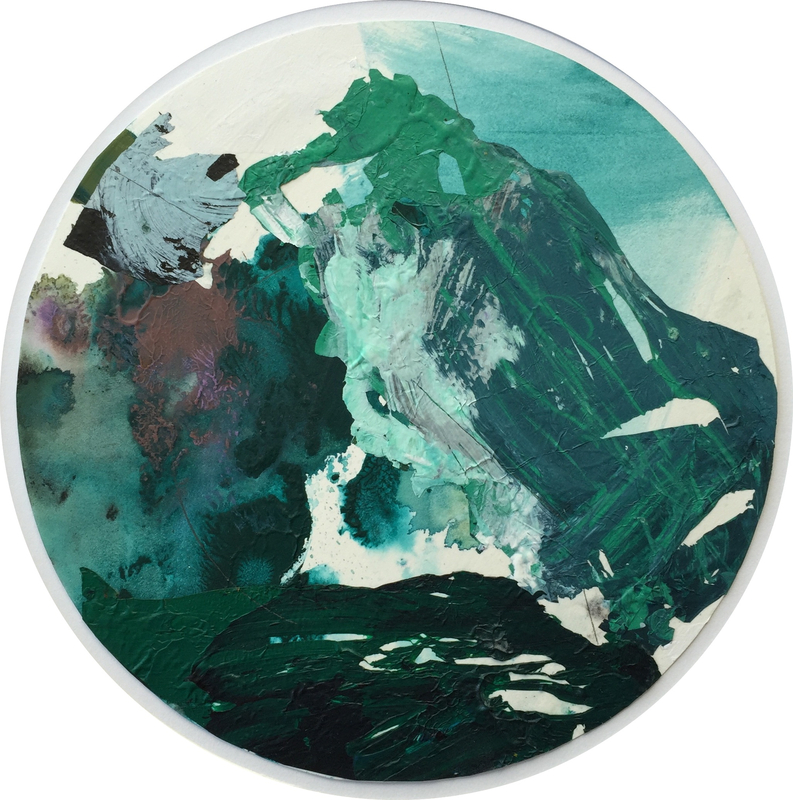 “Sparkling River Tondo.” Acrylic on Canvas (2011). 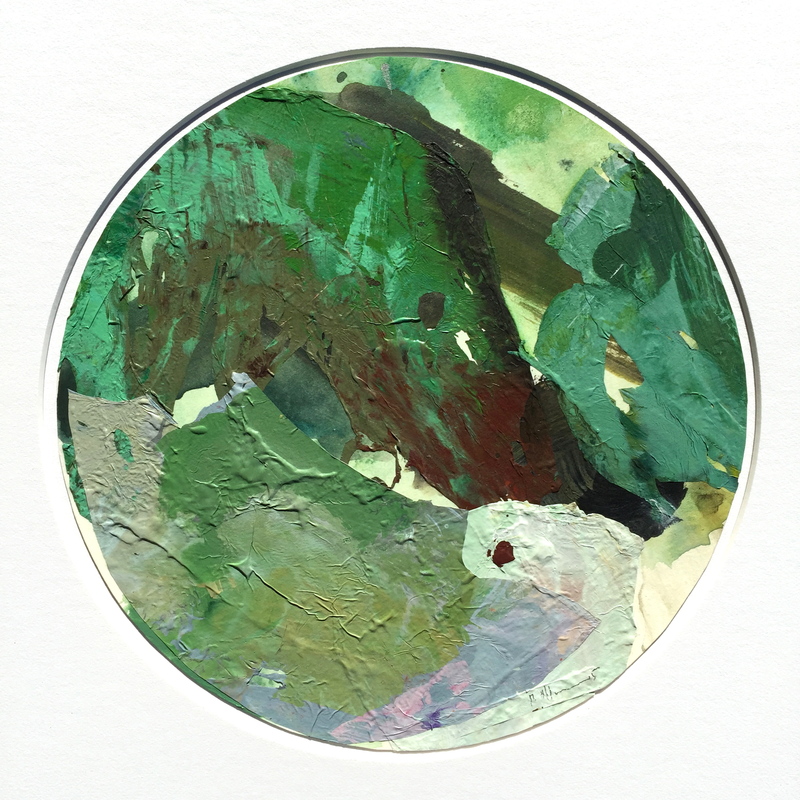 “Lichen / Emerald Fjord Tondino.” Acrylic & Peel Collage on Paper (2015). 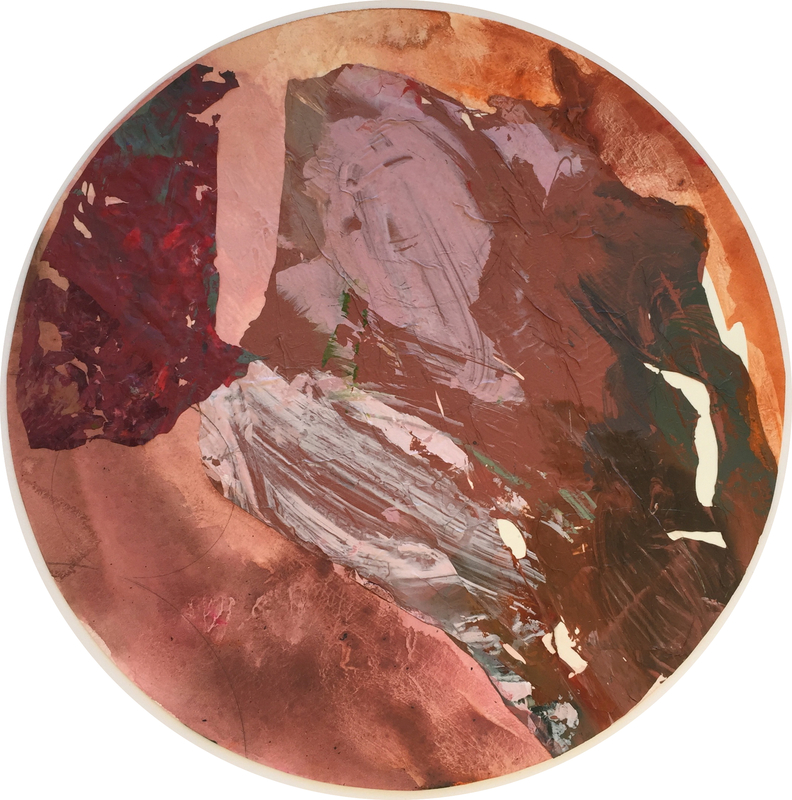 Exhibiting in the United States and abroad for more than 25 years, Rebecca Allan‘s most recent solo exhibitions were presented at: Lillian August Gallery, Norwalk, CT; Rall Gallery at Doane College in Lincoln, Nebraska: ArtLab78 (New York), The American Church in Paris, Ringling College of Art and Design/Longboat Key Center for the Arts; Seattle Art Museum Gallery; John Davis Gallery (Hudson, NY); and Gallery 2/20 (New York). Allan has been a Fellow at the Hermitage Artist Retreat, Virginia Center for the Creative Arts, and Dorland Mountain Arts Colony. Allan received her MFA from Kent State University and BA from Allegheny College. She has taught painting, drawing, art history and writing at Marymount Manhattan College, Purchase College, New York Botanical Garden, Wave Hill, Cornish College of the Arts, Gage Academy of Art, Allegheny College, Heritage Institute at Antioch University, Seattle Art Museum, and Frye Art Museum. From 1998 to 2003 Allan was an artist-in-education with the Washington State Arts Commission. From 2006–2014 Allan was Director of Public Programs at the Bard Graduate Center for Studies in the Decorative Arts, Design History, and Material Culture in New York City. For more information on the artist, visit rebeccaallan.com.